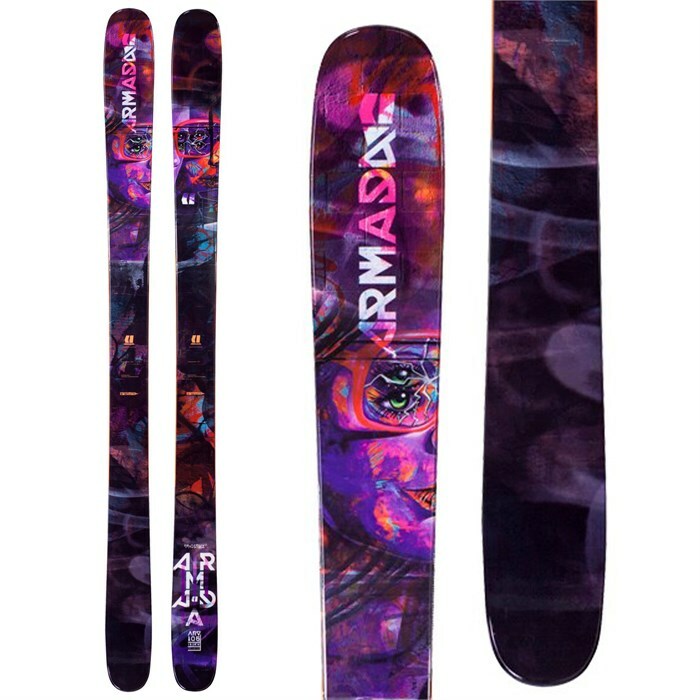 The Armada ARV 106 Skis are the ultimate daily driver when it comes to more surfy all-mountain freestyle skis. A playful Pop-Lite core is enhanced with the responsive "springiness" and longevity of carbon-Kevlar® struts which strikes a dreamy balance of lightweight performance. Perfect for slaying overnight refreshes, these skis also perform admirably well surfing through the park, airing off side hits and just about everything in between. Lay your claim to every jib and natural feature your mountain has to offer with the Armada ARV 106 Skis -- they can truly do it all! AR Freestyle Rocker  Rockered tips and tails are combined with positive camber underfoot to allow the ski to charge with ease through unpredictable snow and maintain a solid carve when asked to do so. Turn the whole mountain into your playground. Spin Tip  Keeps the ski light and stable. Pop-Lite Core  Lightweight wood is combined with a higher density, stiffer species in a horizontal laminate to create an impossibly lively ski that has all the power needed for boosting to new elevations. Carbon Kevlar Struts  Carbon and Kevlar stringers used in the tip and/or tail to add pop and extend life. AR50 Sidewalls  Cap construction in the tip and tail, and sidewall underfoot, balancing performance characteristics with lower swing-weight and increased durability. S7 Base  Durable and low maintenance, with a speed additive for quickness.